Sixteen-year-old Sonia Ocampo was born on the night of the worst storm Tres Montes had ever seen. And when the winds mercifully stopped, an unshakable belief in the girl’s protective powers began. All her life, Sonia has been asked to pray for sick mothers or missing sons, as worried parents and friends press silver milagros in her hands. Sonia knows she has no special powers, but how can she disappoint those who look to her for solace? Still, her conscience is heavy, so when she gets a chance to travel to the city and work in the home of a wealthy woman, she seizes it. At first, Sonia feels freedom in being treated like all the other girls. But when news arrives that her beloved brother has disappeared while looking for work, she learns to her sorrow that she can never truly leave the past or her family behind. 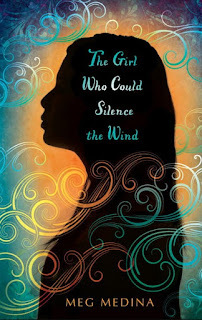 With deeply realized characters, a keen sense of place, a hint of magical realism, and a flush of young romance, Meg Medina tells the tale of a strongwilled, warmhearted girl who dares to face life’s harsh truths as she finds her real power.